The first international day for LGBTQ+ scientists in STEM aims to be a celebration of diversity in science. Organised by Pride in STEM, House of STEM, InterEngineering and oSTEM, the day is the first of its kind to celebrate the LGBT+ community across all the sciences. The important goal of the organisers and supporters – among them, the Royal Society of Biology of which I am proud member – is to recognise scientists who identify themselves as LGBTQ+ within the STEM community. All of us who identify as LGBTQ+, but also those who might not necessarily do so, are repositories of our own personal histories – singular and distinctive ways of feeling – and diversity is truly a core value and hallmark of our community. Beyond individual nuances and different life histories, we have learnt to feel part of a community and this has empowered us, both to advance the recognition of our place in society and to challenge the barriers that unfortunately still prevent too many of us from realizing a fulfilling life. It is important for a community like ours to celebrate inspirational forerunners, who make us proud to be LGBTQ+ people in science. We may not always have the personal accounts of historical LGBTQ+ scientists, but we know that in so many ways they employed courage in the face of barriers and discriminatory practices to live within repressive societies that dismissed or prosecuted LGBTQ people like them. However, in recent years a more open and accepting society has allowed LGBTQ+ people in STEM to share their stories publicly. 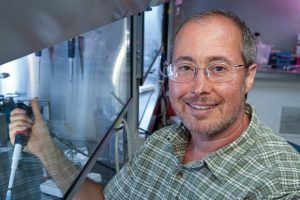 When thinking about #LGBTQSTEMday, my mind immediately went to Professor Ben Barres, a neuroscientist and my personal trans-gender ‘hero’ in science. Ben Barres passed away last December, but I still wish to celebrate him today. He and his team contributed important discoveries about the role of glial cells in the function of the nervous system, which opened the door to a thriving field of research. Ben was born Barbara in West Orange, New Jersey and from an early age showed a passion for mathematics and science, despite being regularly denied access to courses as a girl. A summer course with no gender restriction at Columbia University in NYC sparked his love for biology. Ben embarked on a BSc in biology at MIT followed by a medical degree at Dartmouth College. He then undertook his PhD in neurobiology at Harvard and came over to University College London to pursue a postdoc, when he started working on the scientific love of his life, glial cells. 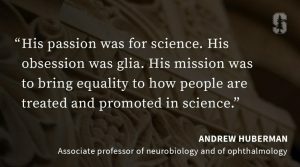 As a principal investigator, he had his lab at Stanford University where he was elected chair of the Neurobiology Department. In 1997, he transitioned to male and was elected the first openly transgender scientist in the National Academy of Sciences in 2013. Despite my love and interest in neuroscience, it is for a more private reason that I would like to thank him and celebrate him as a LGBTQ+ champion. I never met Ben in person, but his generosity and outstanding status as a scientist and mentor left nonetheless a living and vivid impression on me. It was in a dark time of insecurities, doubts and hurt pride, that I came across Ben’s opinion ‘How to pick a PhD advisor’. I felt much anger and sadness at the time and did not know where to turn for support and help. After reading Ben’s advice, I poured all my feelings in a very long email to him, to thank him for his honest look at the issues, but without expecting a reply from a famous and busy professor. He also held the opinion that an advisor should be ready to go above and beyond to support their mentees and his generosity helped many scientists to move from his lab on to independent positions. Shortly before passing away, he discussed this very same issue. He denounced how many principal investigators block postdocs’ path to success preventing scientific innovation. I later discovered that Ben spoke up for other injustices, among them the chief one of gender inequality. When some eminent Harvard professors claimed that lack of equal success of women in science is due to innate gender differences he demanded from them to at least review the evidence available before advancing discriminatory arguments. Needless to say, when data from gender-blinding studies is available it suggests that a different outcome between genders in academia has more to do with unconscious cognitive bias in judging panels than any postulated innate difference in the brain or behaviour between male and female applicants. What has this all to do with being a LGBTQ+ person? After all, every person who values evidence and applies rigor in their analysis should have demanded the same. 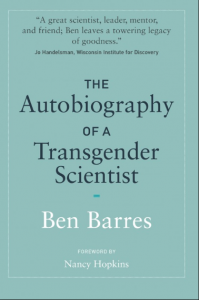 In Ben’s own words we can appreciate how being a woman in science who transitioned to become a trans-man in science has shaped his views. This is exactly why I am proud of him and all those LGBTQ+ scientists who despite sometime vicious resistance never give up, and live their lives fully and earnestly. Being part of a minority has helped them to see beyond their own special characteristic to embrace the importance of supporting all minorities across the spectrum: disadvantaged socio-economic background, ethnicity, gender, sexual orientation, physical impairments and neuro-diversities. For me this is pride: to live an uncompromising, fulfilling life, without grudge even in face of continuous challenges but to affirm your right to self-determination with courage and honesty; to strive to always be the best version of yourself. In Ben’s words: “I lived life on my terms: I wanted to switch genders, and I did. “I wanted to be a scientist, and I was. “I wanted to study glia, and I did that too. Find out more about LGBT+ STEM Day online, or join in on social media using the hashtag #LGBTSTEMday. Find out more about the RSB’s equality and diversity initiatives here.